A closer view of the patch bay. Keeping tape loops in order. 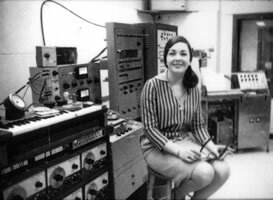 Norma Beecroft is part of a generation of pioneering professional composers that firmly established Canada's place on the world's musical map. An award-winning composer renowned for her use of electronic sound, Beecroft has been commissioned by many of Canada's leading artists, ensembles and organizations. She has also enjoyed a long career in broadcasting, in television and as a radio producer, commentator and documentarist for the CBC and CJRT-FM radio. Many of Beecroft's compositions combine electronically produced or altered sounds together with live instruments, with the electronic music serving as an extension of vocal and/or instrumental sounds. 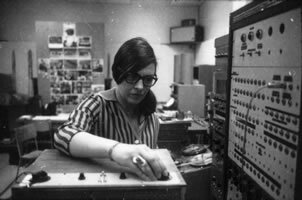 Due to her intense interest in technology in music, in the late 1970s and early 1980s, she interviewed many of the world's leading composers who were among the first to use technology in their music. This extensive research, under a tentative title Music and Technology, documents a new period of musical history, beginning primarily after World War II. From this research, Beecroft has extracted some of her comments in this presentation to the Audio Engineering Society. For her service to Canadian music, Norma Beecroft was awarded a Doctor of Letters, honoris causa, from York University in Toronto in 1996. 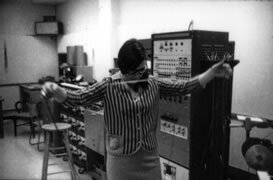 She is an honorary member of the Canadian Electroacoustic Community. Foundational text and photos courtesy of Norma Beecroft. What an excellent review of a first class professional.It is due to those people like Norma who used their technical skill to improve and enhance the field of recording that has resulted in the 'Wall of Sound' that modern listeners have become accustomed to listening to. 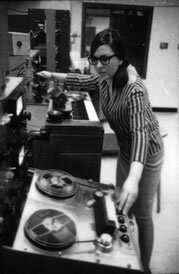 We thought a quarter second delay using Ampex equipment in 1962.Norma and similar professionals took recording to higher levels.